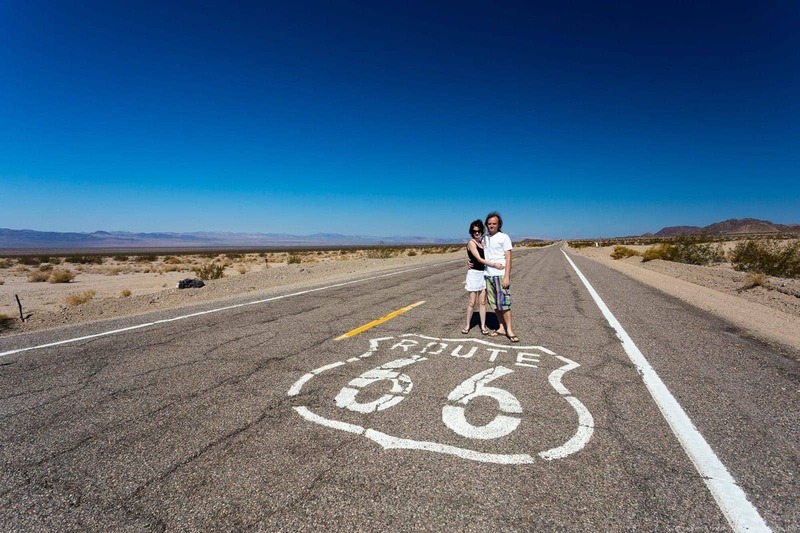 Home » Destinations » North America » USA » Route 66 in California – All the highlights! Route 66 is without doubt one of the world’s most legendary roads, and a road trip along it is something I’ve always dreamed of doing. In mid-2015, Jess and I had the chance to tour the US and we decided that driving the entire 2,400 mile length of Route 66, from Santa Monica in California, up to Chicago, Illinois, was going to be the definitive road trip for us. With a side trip to the Grand Canyon, of course. Crossing eight states and much of the country, our two week adventure along Route 66 was an absolute blast. 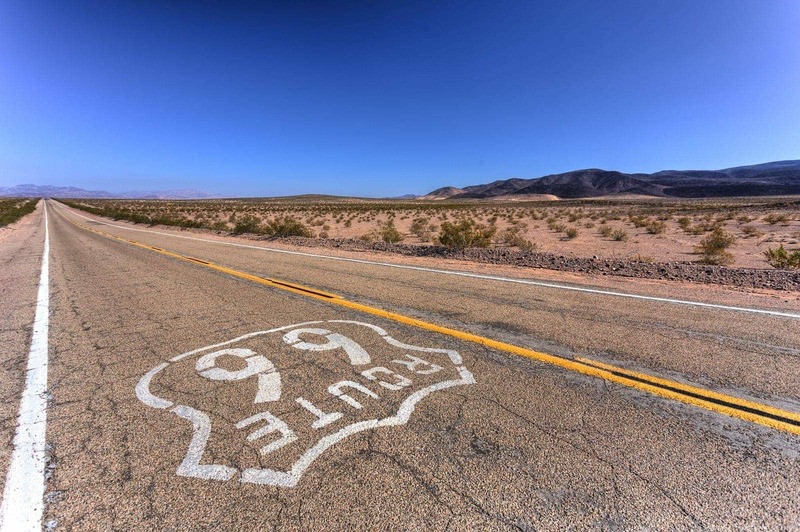 You can find out more about how we went about planning the definitive Route 66 Trip in this epic post by Jess. 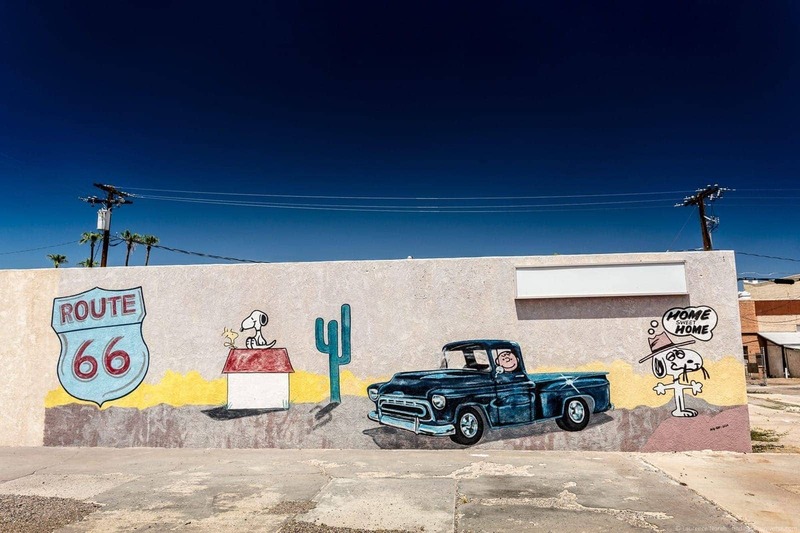 In this post, I’m kicking off an eight part series of photos from Route 66, which I’ll be dividing by State, to give you an idea of what you’ll see along the way, including some of my favourite photos from the trip. Stay tuned for more as we go through all the States! Spoiler alert. The desert phase of Route 66, as we drove the old road through vast expanses of the Mojave desert, were easily my favourite. The open road, the open sky, those landscapes stretching out forever. What’s not to love?! 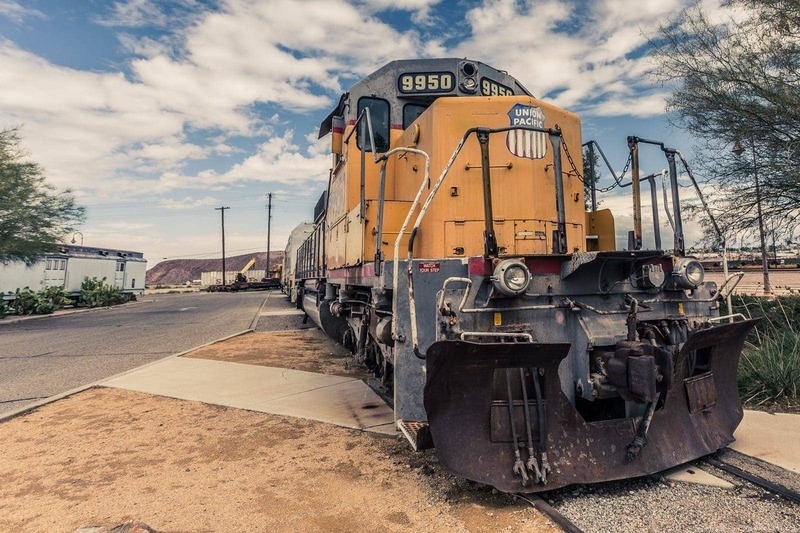 I was hugely surprised when we drove Route 66 by quite how much freight train traffic there is in the US. Passenger transport numbers in the US may not be very high, but there sure is a heck of a lot of freight plying the railroads of the US! 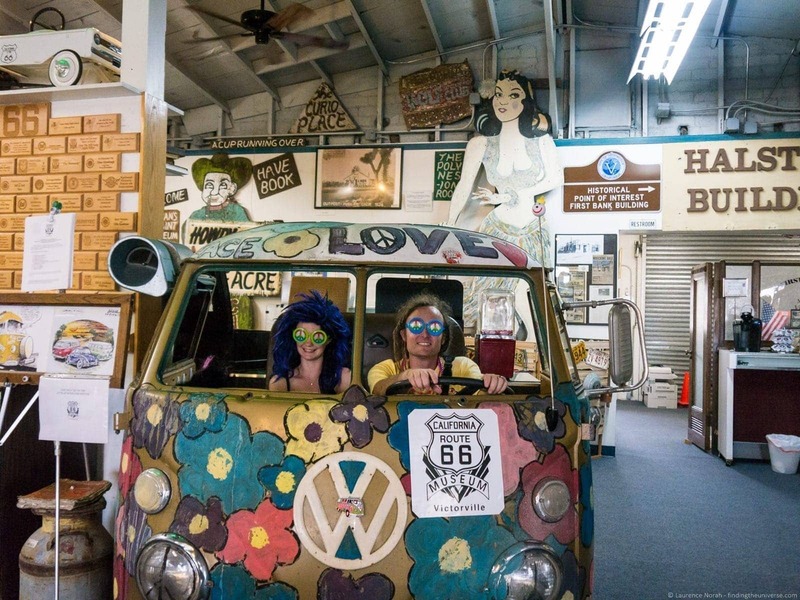 There appears to be a Route 66 museum in every state. The first one we visited was in California, and naturally we took advantage of the opportunity to sit inside an old VW and wear wigs and sunglasses. Oh wait, I didn’t need to wear a wig, I just have hair like that already. 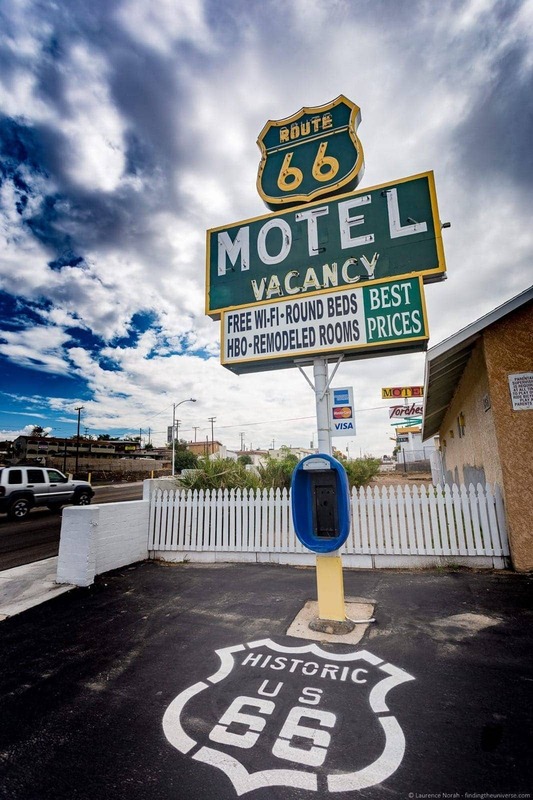 A highlight of Route 66 is the wacky accommodation on offer. 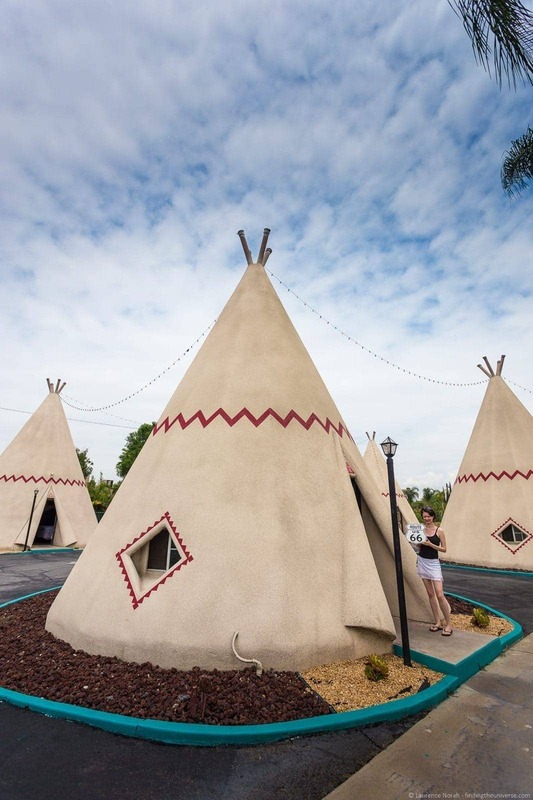 This for example, is the San Bernandino Wigwam Motel. It’s not even the only Wigwam Motel on the route! If you’ve always wanted to stay in a concrete wigwam, this is your chance! 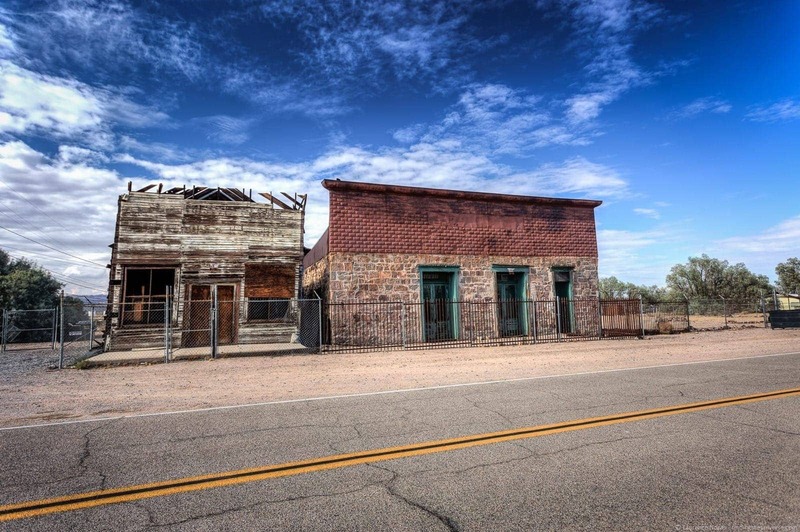 The other fascinating, if slightly depressing, aspect of Route 66, is how abandoned so much of it is. When the interstates were built to replace routes like this, traffic (and the income associated with it), disappeared, entirely killing off communities and businesses. The result? A lot of derelict motels, gas stations… and everything else. 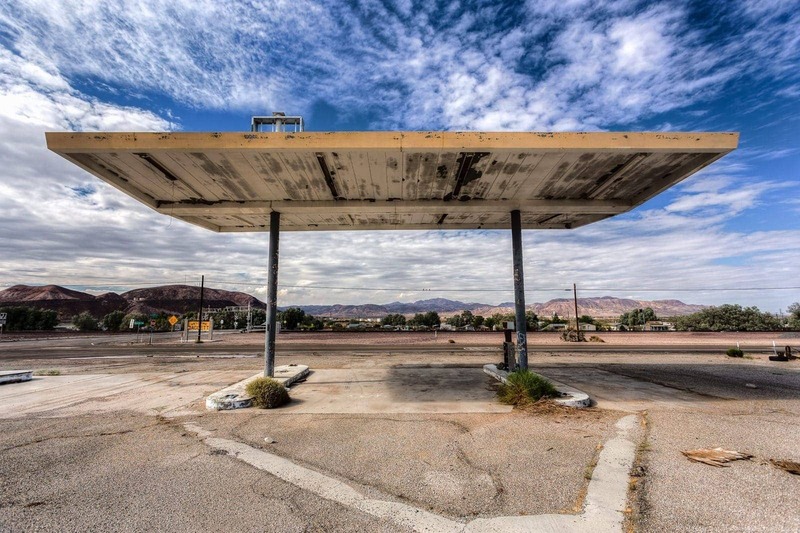 There are a lot of abandoned gas stations. It’s not all abandoned of course, although many of the buildings are repurposed. Here’s the Harvey House at Barstow train station, once a hotel, now repurposed into local administration buildings and museums. There’s also a lot of trash along the way. 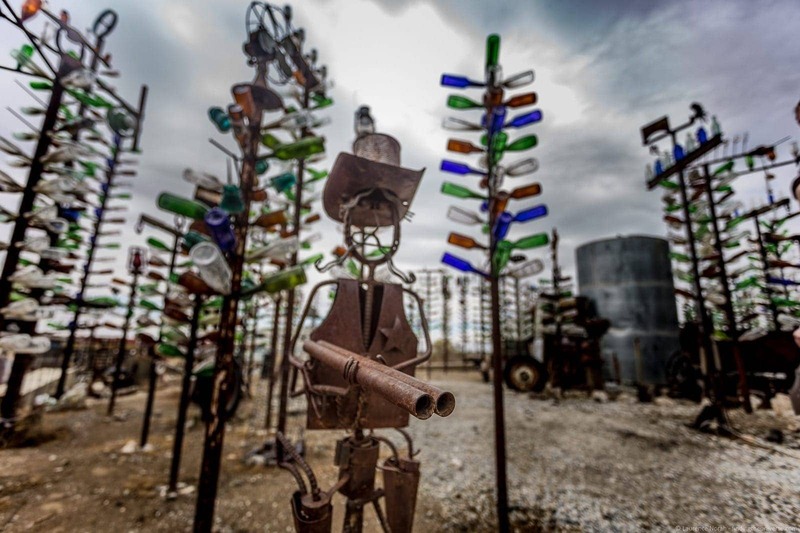 Here an enterprising individual has turned that into a bottle tree forest and sculpture park, known as Elmer’s Bottle Tree Ranch (tripadvisor link). 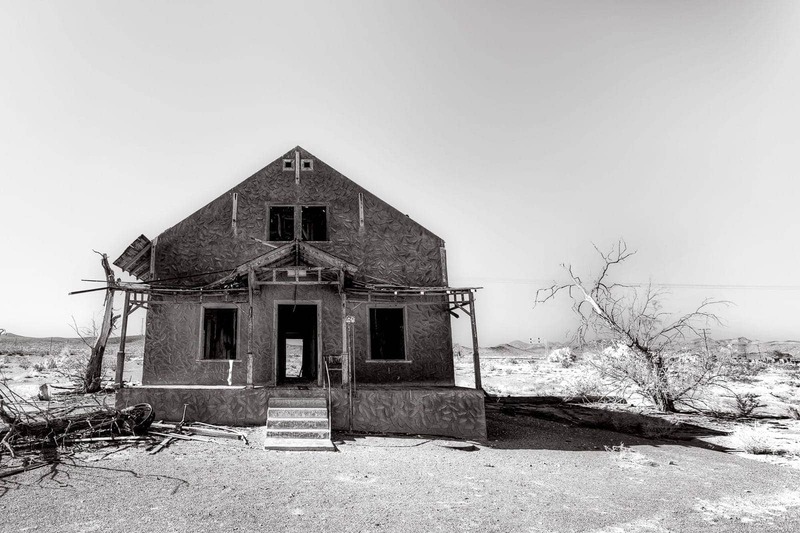 There are also towns that have been abandoned since before Route 66 came along. 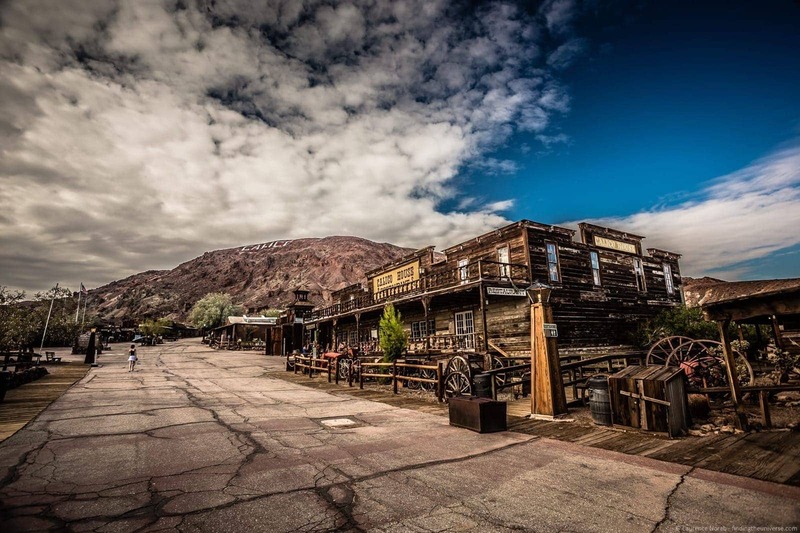 Once home to over 3,500 people, when the price of silver crashed at the end of the 19th century, the town of Calico became a ghost town. Nowadays it’s open as a tourist attraction, managed as a Regional Park, and is very much worth stopping at. Sometimes Route 66 is really easy to follow, with giant photogenic signs like this to follow. Other times, it isn’t. Thankfully, there’s an amazing guidebook to help out. Plus this post from Jess, of course. 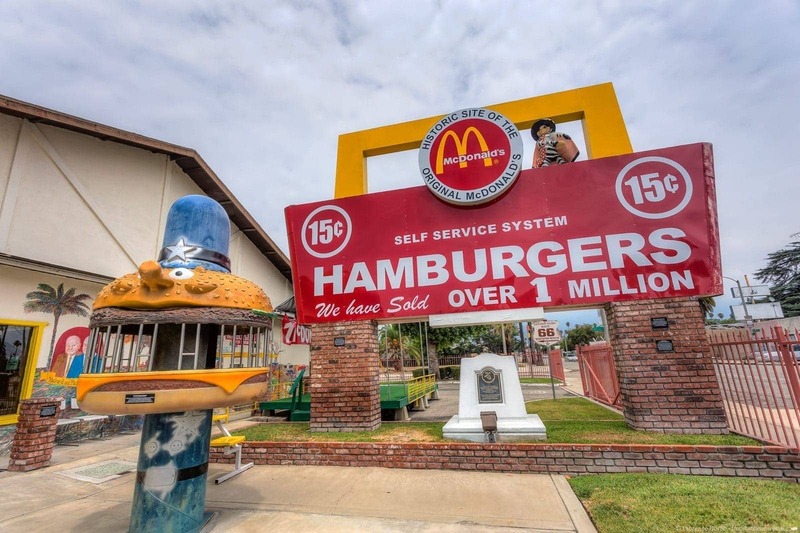 This part of Route 66 is also home to the location of the world’s first McDonald’s! We were a little disappointed that we couldn’t have an actual McDonald’s meal here as it’s no longer operational, but we did enjoy peering around the free museum anyway. 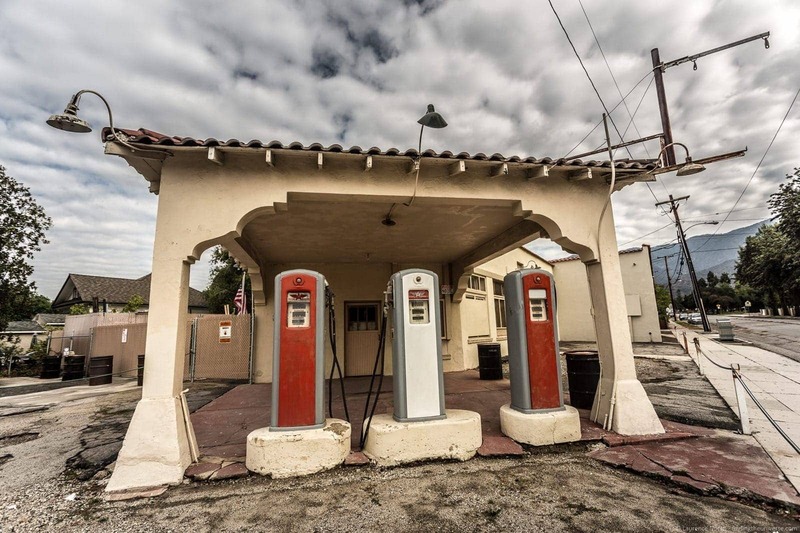 Abandoned gas stations abound – this was the first one we found. 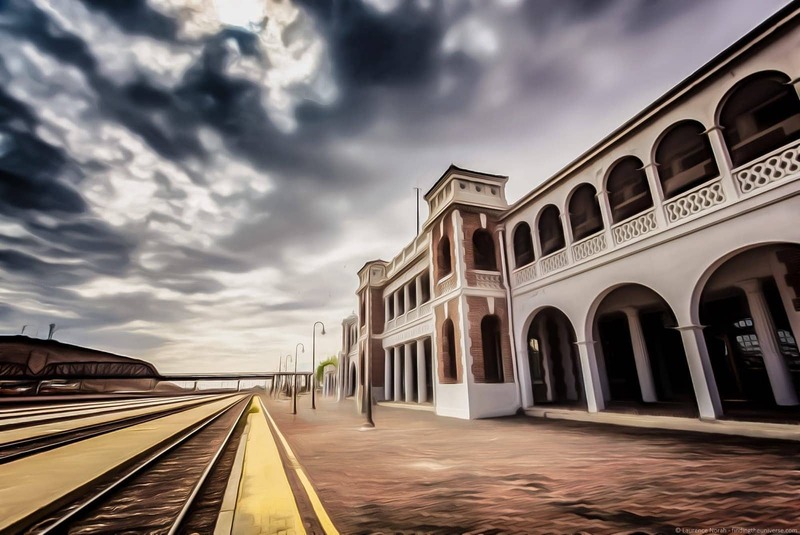 The cost of upgrading these stations to keep up with environmental regulations meant that the majority of these small businesses went out of business, not helped by the lack of traffic plying the old routes. There are lots and lots of Motels along the route, in varying stages of repair and upkeep. The signs are quite the spectacle. Needles, where we entered the Mojave Desert, was the hottest place on our trip. Driving in July / August was probably not the wisest choice, now I think back. It hit 106F at this point on the journey – and forced us into an air conditioned motel for the night! 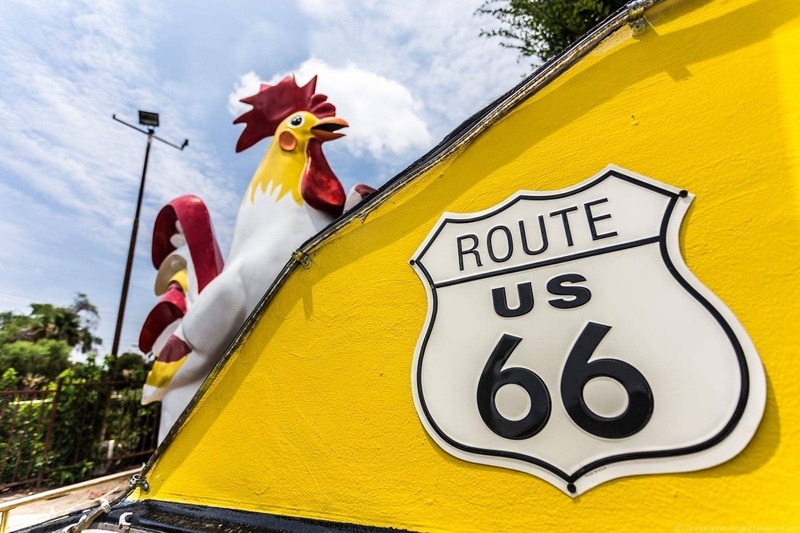 I’m not sure anything says Route 66 quite like a giant plastic chicken. And a sign that says Route 66 of course. More motel signs. This series will likely feature quite a few of these. 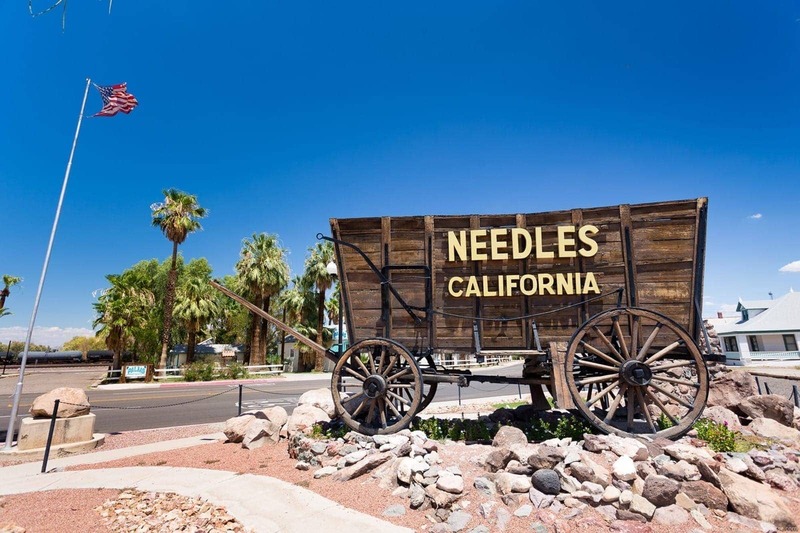 You know who else lived in Needles? Snoopy’s brother Spike! Here he is, depicted on one of the may Route 66 murals that can be found on the journey. Here’s another one, also featuring our glorious green steed. 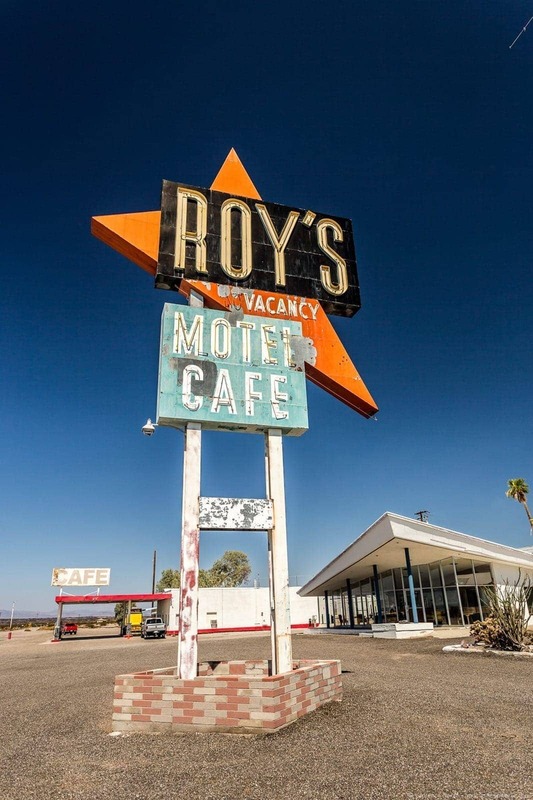 Finally, to wrap up this photo essay, one of the most famous Motel signs on the route – that outside Roy’s Motel and Cafe. Which is still operational! We stopped and had a root beer, and chatted to the owner awhile, before heading on our way. Lots more to come in this series as we wind our way across the US, faithfully following the original Route 66 as closely as we could. 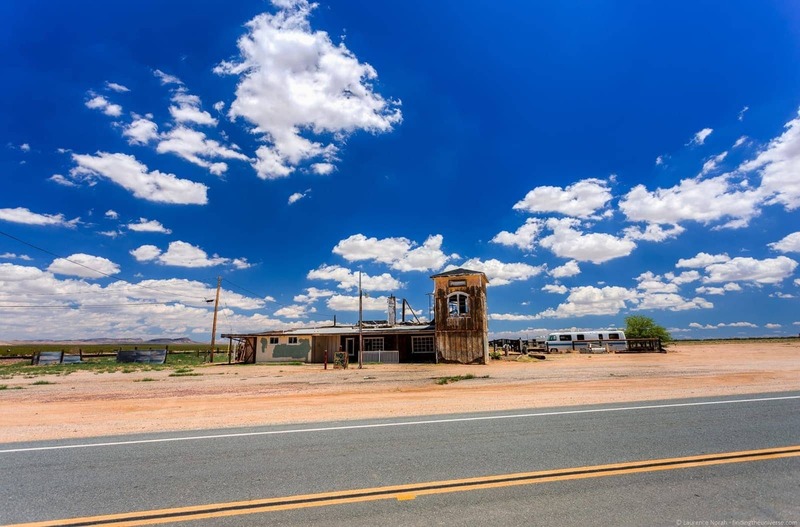 Then, take a look out our incredibly detailed day by day Route 66 itinerary, which covers all the sights you want to see, route tips, lodging options and places to eat. 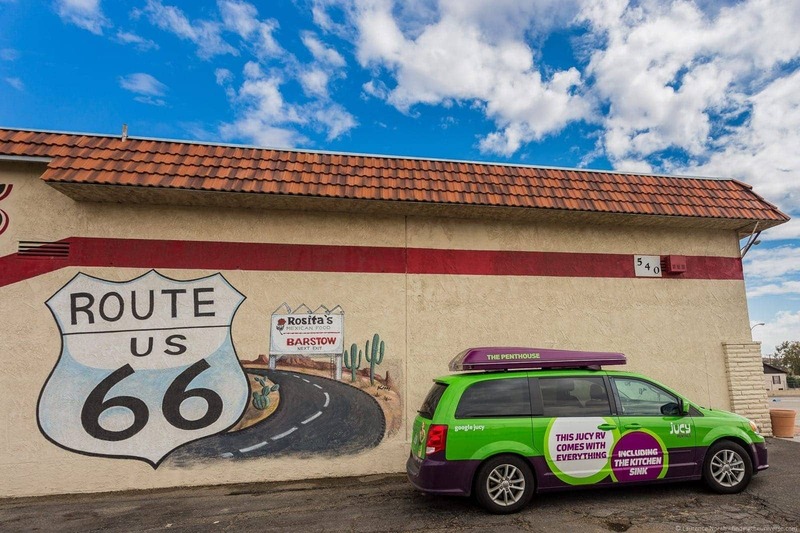 We also have a shorter Route 66 itinerary if you have less time. Awesome blog. 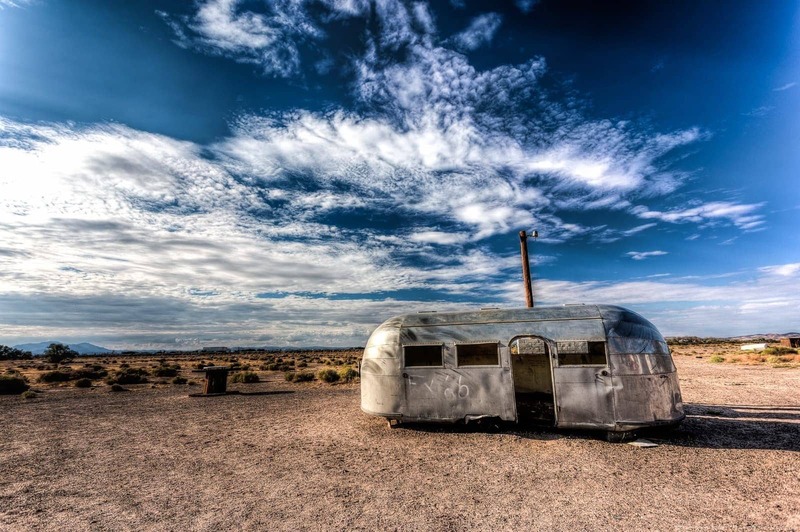 By chance do you remember where the old Airstream was? I have a vintage teardrop trailer and would love to photograph them together. Would love to see that photo if you get it! 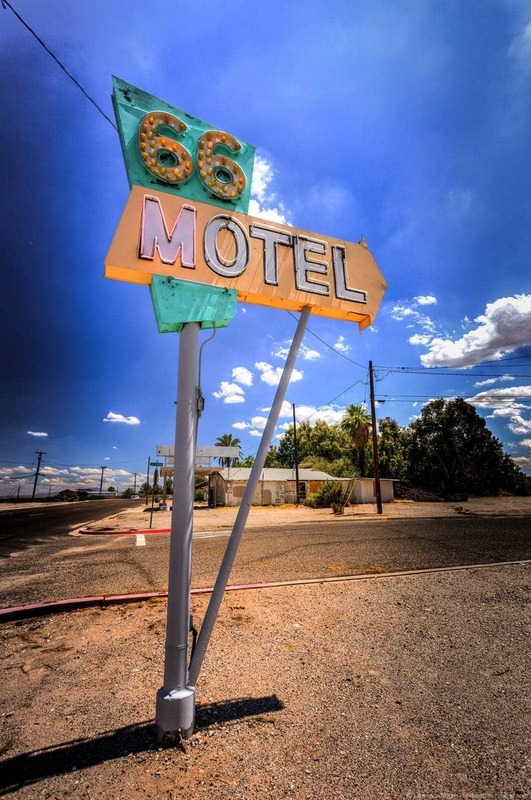 i really love your picture for the route 66 california highlights. What a shot, west USA as its best in a frame. 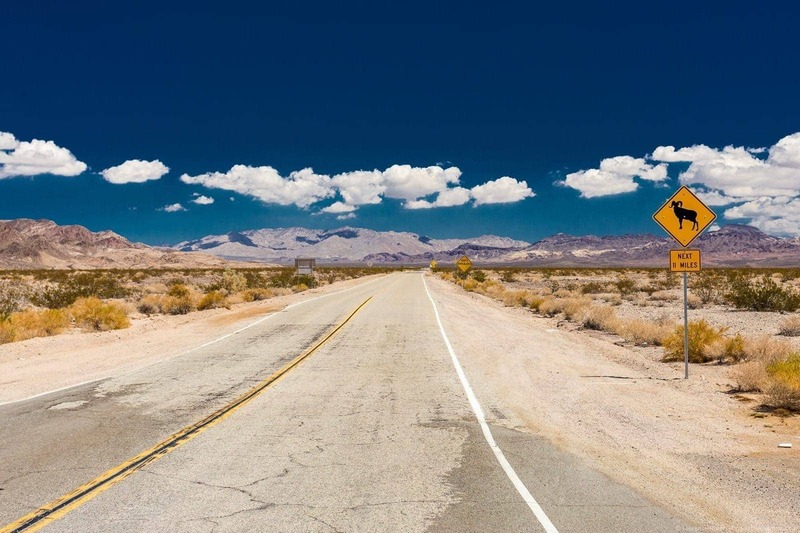 Do you remember where is the location with the big horn sheep crossing road sign? 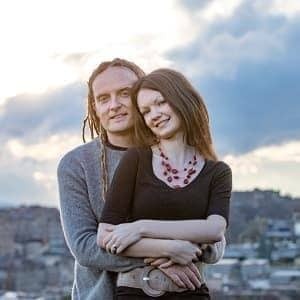 Great website for plan a road trip. Consider Alsace in France for your next trip. My pleasure Nicolas! I have not visited Alsace, but I did live in the Dordogne for 5 years 😀 We will definitely consider it for our future travels though!